Join us at the 42nd Annual Rotary Ball May 11, 2019. This is our theme is "The Titanic" and we will be rocking with the band THE SALAMANDERS. The Rotary Ball is the annual fundraiser for the Gillette Rotary Club. Last year we were able to contribute over $50,000 to local Gillette charities, and support numerous scholarships and programs in the community. We helped in the community by Installing the Rotary Point Park Playground equipment, Benches on the Walking Path, Main Street Clock Tower, Boys & Girls Club Art Room and MANY MANY other local Projects. 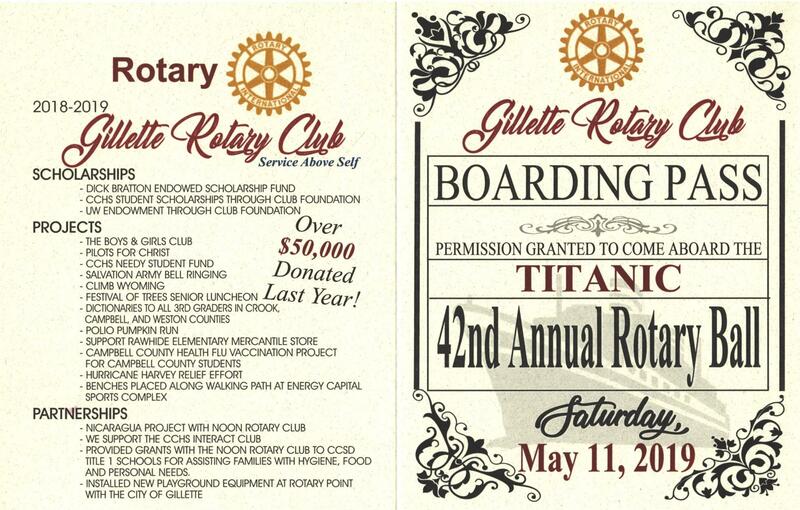 IF you are wanting to participate or suggest a Service Project, please contact a Gillette Evening Rotarian. This year we are having fewer tickets available this year so get yours before they are sold out! The main event ticket is ONLY $250 and gets you dinner for two and into the grand prize raffle of $20,000, 2nd prize of $5,000 or 3rd prize of $1,000 . Also, every 40th ticket drawn will receive $40. The Big 50 raffle is an additional $100 for a chance at $5,000! So for a combined ticket price of $350 you could potentially win $25,000! Tickets are on sale NOW and can be purchased from local Rotarian's or by calling or texting your favorite local Rotarian or Mark @ 307 680 2625. ALSO - you can purchase a ticket online CLICK HERE!